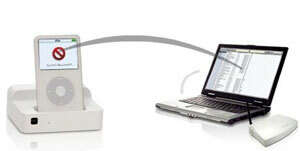 Silex Technology has launched wiDock, a wireless dock for the Apple iPod that allows users to transfer songs and videos. According to Silex, the wiDock is the first solution to transfer songs and videos to an iPod wirelessly while connected to a stereo and TV, becoming an integral part of the living room entertainment system. Users can wirelessly sync with a computer, play music from the stereo, play videos on the TV and charge the iPod battery. The product is available in the U.S. throughout retail stores and retail online sites starting in December 2006.
wiDock is compatible with iPod nano, iPod and iPod mini. It requires a 10/100 wired network or 802.11b/g compatible wireless network and a computer with Windows 2000, XP or Macintosh OS10.x for the installation.